I had a great time using Amy Lazzell's sketch at Pals Paper Arts this week! I hope you will give it a try. There are so many stamp sentiments that could have fit into a circle for this card. I hardly ever had a sympathy card sitting around, and I find timing is of the essence when you want to send one, so I thought I'd make one ahead of need for once! To take my circle sentiment to the next level, I added tiny blooms from Botanicals for You and then used my clear Wink of Stella to give them some sparkle. A tiny pearl went into the middle of each. The beautiful Mint Macaron matches one of the many colors in the floral Birthday Bouquet Designer Series Paper and adds a little richness and an antique look. I am glad you came by today. I hope you will leave me a comment. They make me smile. 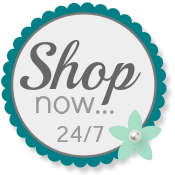 Please use my Online Store any time. Your card-making supplies will be delivered right to your door! I appreciate your business--it keeps me in cards! Your floral design is sooo pretty......love the lace ribbon! 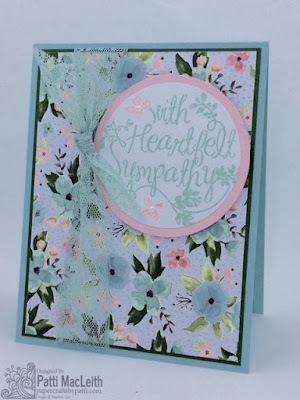 I love this sympathy card on that gorgeous DSP! The ribbon and sentiment are perfect for it. Beautiful card Patti! I love the addition of the small flowers from Botanicals For you. 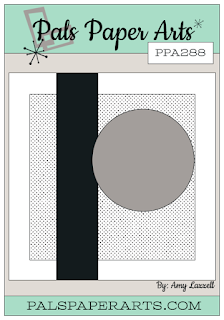 And, the color combo is so serene . Perfect for a sympathy card! 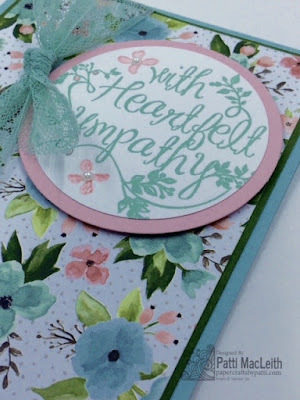 Such a pretty sympathy card, Patti! So soft and pretty. A lovely expression of sympathy. Absolutely stunning, Patti! Great paper choices...and the ribbon is the perfect touch! Such a delicate design and beautiful. You know how to work that color. I love it! Beautiful card - this paper is so comforting but I loved how you used the lace ribbon....perfect! What a fabulous card!! Love the use of the lace!! So pretty Patti!! !